What Makes A Book Club Great? 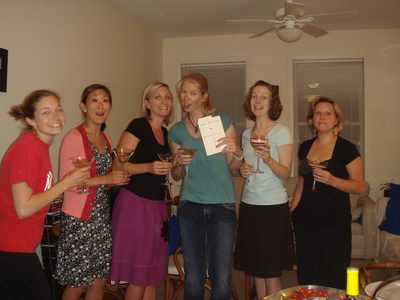 This Chapel Hill, NC book group has only recently started and its members are all in their 20s. Oh, you are, too! Don't give me that look! I wondered how the youngin's would react to QUEEN OF THE ROAD, ie could they relate to the midlife crisis catalyst? What about the other ahem "older" issues? But, the gals assured me that they could relate: One of them, in fact, just had an early life crisis of her own, completely changed her career and now owns her own business. Of course, when another chimed in that she could understand those issues "because my dad went through that," I nearly choked on my wine (which would have been a shame, as a mighty wine it was). One of the best questions they asked was "What makes a good book club?" As someone who has been in one for over a decade, and who has called into... maybe 100 or so since QUEEN OF THE ROAD came out, I guess I am a good one to ask. Great drink and food (in that order, if you haven't already figured it out) is a given. But there are two other things: Every member should feel she has input into the book choices. Not necessarily for each choice, but at least that her voice and preferences are heard. Then, just because a book is a good read, doesn't mean it's good for discussion. A great place to check out what other clubs are saying about the discussion aspects of books is Bookmovement. Truly, this club seems off to a great start: They were lovely, asked interesting questions (and even wrote them down - we'll see how long that lasts) and seemed to be having a lot of fun - also crucial for a great book club. They're just so adorable, I had to post this picture, too. 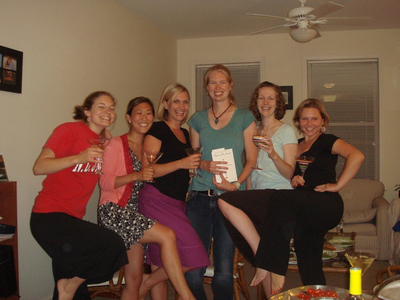 What do you all think makes a book club great? I finished "Queen of the Road" today from the back of our motorcycle on I-90 speeding across Montana on our way to Glacier National Park. To say I loved the book would be an extreme understatement - you are my hero!!! My husband and I are on an open-ended motorcycle trip from Springfield, MO headed to Alaska and as the miles rolled by, you conjured up all kinds of thoughts for me about the importance of life vs. stuff. Hope you are writing another book - I'm ready to read it. This page contains a single entry from the blog posted on July 7, 2009 11:31 AM. The previous post in this blog was Hi Ho, Hi Ho. The next post in this blog is Newport Newcomers.